London: George G. Harrap, 1958 pp 132 including index with a section on questions and suggestions for practical work. Illustrated with a frontis photo and drawings in the text. Pictorial red boards. Very Good. London: Prentice-Hall Inc, 1962 The Foundations of Modern Biology Series. pp xiii 114 including index. Illustrated with photographs, drawings and diagrams. Blue boards, gilt. Very Good in Good protected dustjacket. London & Glasgow: Blackie, 1972 pp vi 74. Illustrated with photographs. Pictorial paper-covered boards. Very Good in Very Good protected price-clipped dustjacket. Oxford: Pergamon Press, 1969 pp xi 129 including index. Illustrated. Plastic-covered paperback. Ex-College Library stamped on top and fore edge of page block, inside covers and on half-title page. Good. 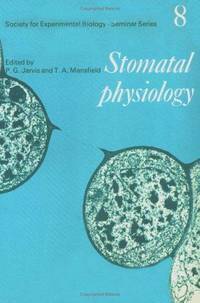 By Jarvis, P. G. & Mansfield, T. A.
Cambridge: Cambridge University Press, 1981 Society for Experimental Biology. Seminar series 8.pp. viii 295 including index. Illustrated with photographs and diagrams. Pictorial card covers. Good. By Garbutt, J. W. And Bartlett, A. J.
London: Butterworth, 1972 pp viii 238 including index. Illustrated with drawings and diagrams, grey boards. Ex-College Library with new endpapers stamped on fore edge of page block and in bottom margins of a few pages only. Otherwise Very Good in Good protected dustjacket, a little faded at spine and along top edge. By Barrington, E. J. W.
Oxford: Clarendon Press, 1963 pp xiii 387 including index and bibliography. Illustrated with 16 plates and with drawings and graphs in the text. Blue cloth, gilt. Near Fine.